Our Energy Solutions & "Packages"
The Future of Electricity is Here. At WirelessPawa.com, we promote the use of clean energy to usher in the era of "distributed generation" of electricity. Just like mainframe computers versus personal computers (PCs), this is preferable to the current “centralized generation” model whereby electricity is generated in massive amounts at particular centralized locations, then transmitted over hundreds, even thousands, of miles to the end user. At WirelessPawa.com we enable households and communities to take control by having their electricity generated locally to serve all their household and commercial needs reliably and more predictably. Thereafter it can be stored in safe, non-toxic, long-lasting, environmentally friendly, lithium-ion batteries and used on-demand. Technology has enabled us to move to a “wireless” world in the fields of computing and telephony; with attendant benefits, increased productivity, and the unlocking of economic potential. This model is expected to yield similar results in the world of electricity. We partner with alternative energy product manufacturers around the world, to distribute the latest, safest, most cost-efficient and overall best alternative energy products. 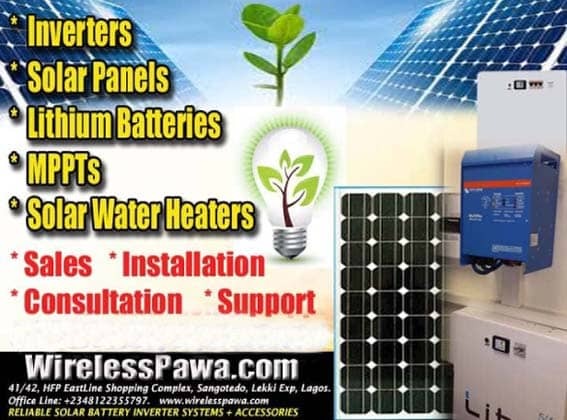 We launched our solar panels/batteries/inverters sale and installation services in 2018. The move to alternative energy is well underway -- and we are at the forefront of this movement. We believe that energy can and will be both clean and low-cost going forward, resulting not only in cost savings and added convenience, but also in a cleaner, healthier environment. Contact us by phone or via email regarding any product or service inquiries that you may have or for sales information, or regarding any questions that you, your household, or your business may have. Also, please be sure to keep up with projects we're up to, and to see what we are reading and thinking about (on our blog and social media accounts). WirelessPawa.com, Suite 41/42, HFP East Line Shopping Complex, Sangotedo, Lekki-Epe Expressway, Lagos, Nigeria. © 2016 WirelessPawa.com. All rights reserved.